A few weeks ago, when Cervélo first invited us out to Arizona we couldn’t help but notice there was something funny about the itinerary. They didn’t tell us what we would be seeing, or what we would be doing. But if you were following us on Twitter, Facebook, or Instagram you probably noticed we spent not one day, but two whole days out there. And this is not the norm, normally it only takes one day to launch a new bike. So prior to heading out there speculation at AeroGeeks HQ began – were they giving us two whole days with a single new bike or was there a second bike hidden behind all the rumors of the new P5? Our guess ran to the latter. Which begged the question – if there were two bikes, what would they be? The obvious guess for the first was a P5 disc (which we were both right and very wrong about). But what about the second bike? A P3 disc perhaps? One had been rumored just a few months previous. But that didn’t excite us and didn’t feel the Cervélo way. What began to excite us however was the idea of a P3X. A trickle down technology frame utilizing the technology of the P5X – one hopefully a bit cheaper than the $12,000 being asked for a P5X. And then on our first morning in Scottsdale we woke up to find the hoped for but still unexpected – not a new P5 (that was saved for day 2), but the P3X – just about everything we liked from the P5X in a lighter and cheaper package. The PX series is Cervélo’s tri specific series of bikes. These are no compromise weapons for the battle between T1 and T2. Those looking for UCI mandated boxes and angles will be left wanting. And Cervélo recognizes that us triathletes are a unique breed – our bikes are not only our transportation but our rolling buffets and our own support vehicles as well. And PX encompasses all of that – aero optimized room for all the stuff we need. Simply put the P3X is everything that Cervélo learned from the P5X along with the knowledge gained in the sport over the past two years from their amateur and pro athletes alike. All that was mixed together and then iterated on again and again. The result is the bike you see here. It was heavy (that’s a pretty easy one) – The next generation had to be lighter. 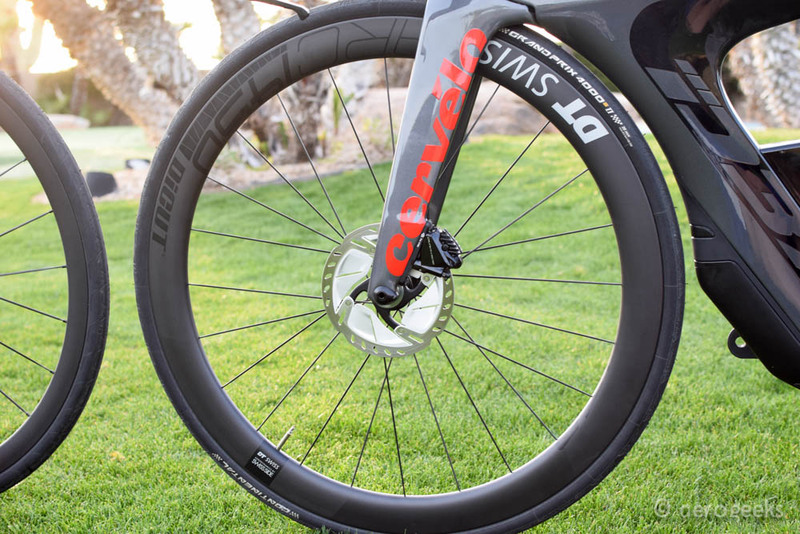 Triathlete storage needs had changed the past few years – For instance we triathletes have for the most part made the jump from tubular to tubed (and now even tubeless) tires. Carbon fiber manufacturing – Since the launch of the P5X, Cervélo’s parent company had invested in overseas facilities that had state of the art manufacturing processes but still could protect their intellectual property. Aspirational – The P5X was the first of it’s kind and this was reflected in the initial cost. The next generation had to be more reachable (ie cheaper). With the challenges laid out – the P3X could come now be crafted. And that started at the production line. While many may not realize it, the ability to own the construction of your bikes is a huge difference maker in the cycling world. Getting carbon right is tricky. Getting it to do exactly what you want is trickier still. On modern bikes a quarter of an inch here or there is the difference between a heavy and noodly frame, and a light and stiff one. 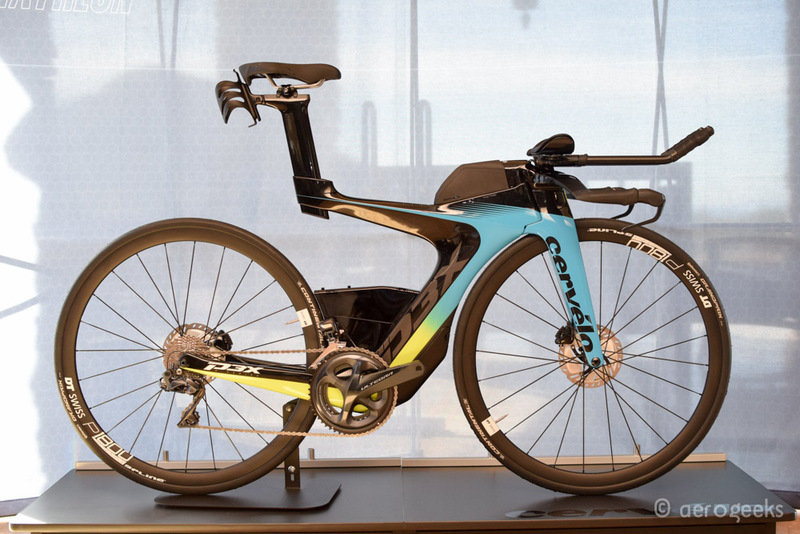 With a new factory that had the latest in carbon fiber construction methods (and the ability to ensure that any Cervélo crafted concepts would stay Cervélo concepts), the engineers could make the carbon dance the way they wanted. 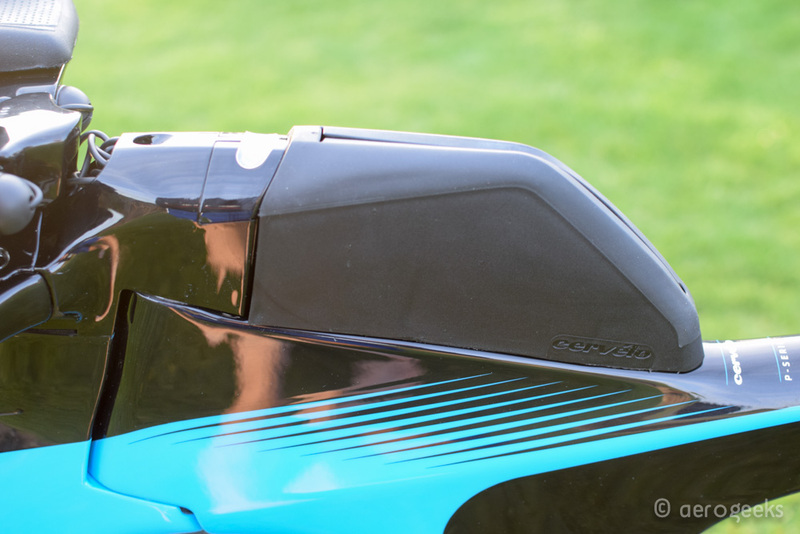 Next came the most important touchpoint on a bike – the cockpit. 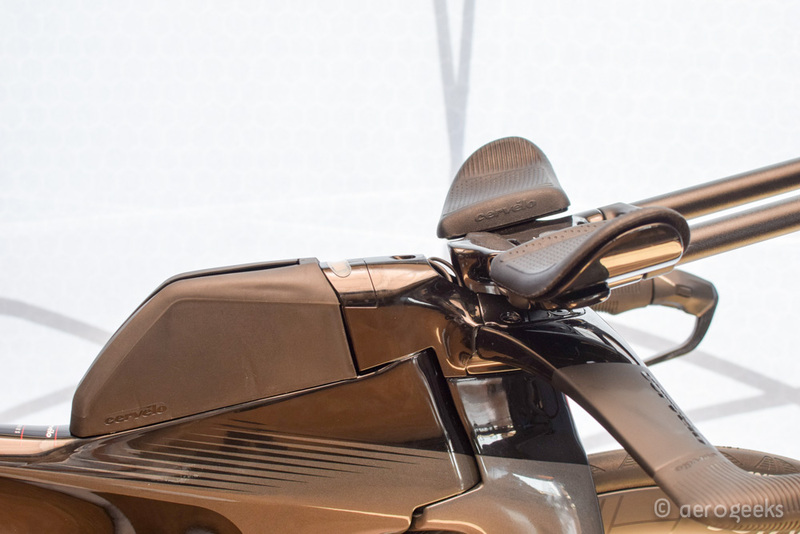 The P5X cockpit is nearly infinitely adjustable. And the new P5 has no tilt adjustment and utilizes only Cervélo specific extensions. The P3X falls in the middle. When we shared the P5X we also shared the image below that gave a sneak peak at what the P3X was going to have to offer (even if we didn’t spell that out). 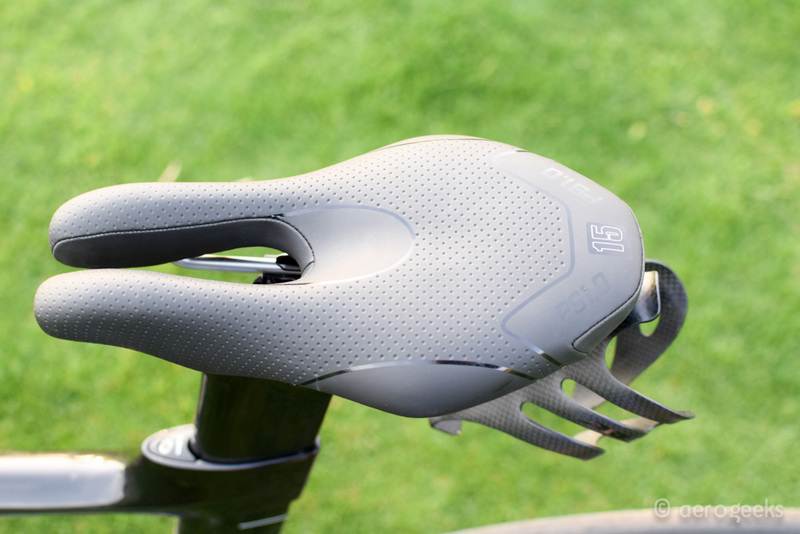 The P3X features a brand-new cockpit built atop the now common (at least for Cervélo) mono riser stem featured on both the new P5 and P5X. You have four options for tilting the cockpit – 0˚, 5˚, 10˚, and 15˚. (Those looking for more variation can swap out to a P5X cockpit, and those looking for 0˚ with more simplicity can swap to the new P5 cockpit.) The new cockpit utilizes just 7 parts as compared to the P5X which has 14 – the result is much easier to adjust and lighter weight. For your upfront hydration needs is a removable bottle bridge. When combined with the standard P3X cockpit you can mount the front hydration system of your choosing. The pads themselves are the same as on the new P5 and have just enough lateral support to keep you stable while not being overbearing. 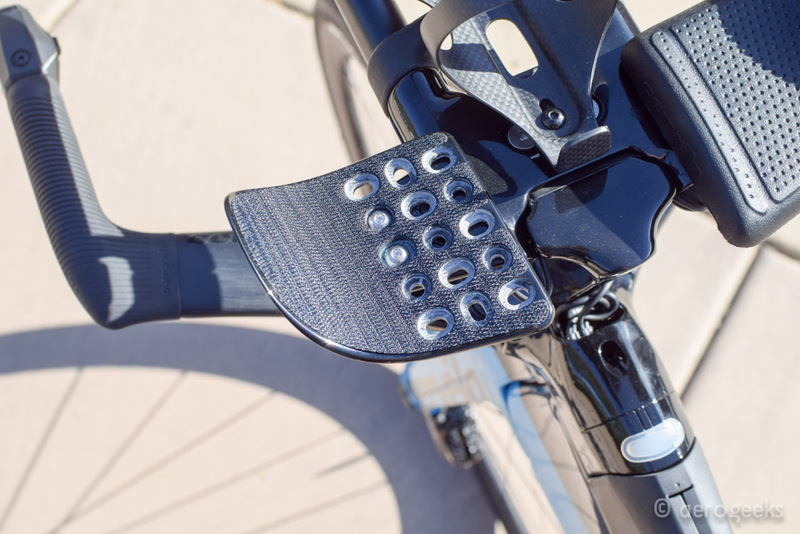 Graham Shrive, Director of Engineering for Cervélo tells us the actual pad material is derived from the same material mouse pads are made with – the benefit is a strong cushioning feeling that in our small amount of time with the bike did not seem to wear at all. 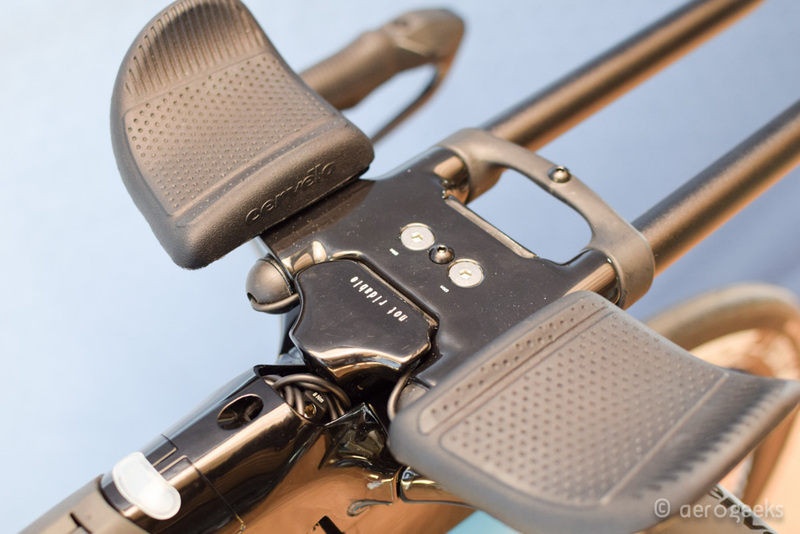 The cockpit utilizes standard 22.2 mm extensions – the ones that ship with the P3X are both designed and built by Cervélo (not outsourced). 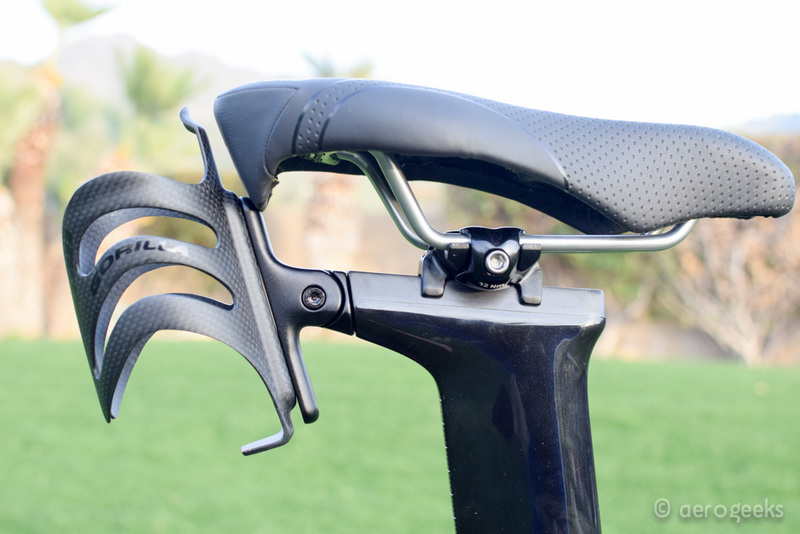 The basebar features the same ergonomic molded grips as found on the new P5. (No more taping and retaping.) The grips can be flipped and cut back (20mm) with the basebar to provide for shorter reach options. To both lighten the bike and simplify the design – the foldable basebar on the P5X (that made packing so much easier) did not make it to the P3X. Instead there is a flippable fixed basebar, which can accommodate both those looking for a more aggressive or more relaxed stance. The cockpit is extremely easy to adjust on your own. We were able to adjust the stem height, extension position, and pads in just a few minutes. Better yet we did not have to remove the pads to adjust the extensions. Like the new P5, the P3X features standard flat mount disc brakes front and back. 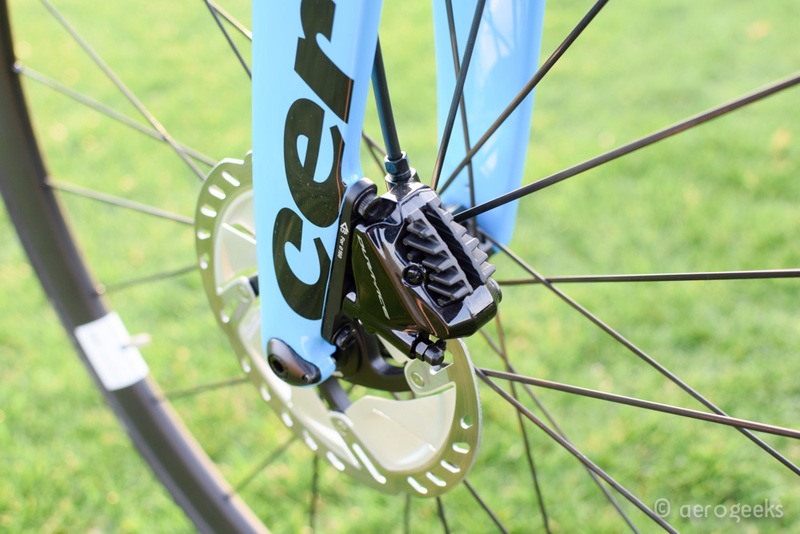 And like on the P5 we were a bit surprised to see that Cervélo had not added any fairings around the brakes or calipers (something we have seen other companies starting to integrate into their bikes). 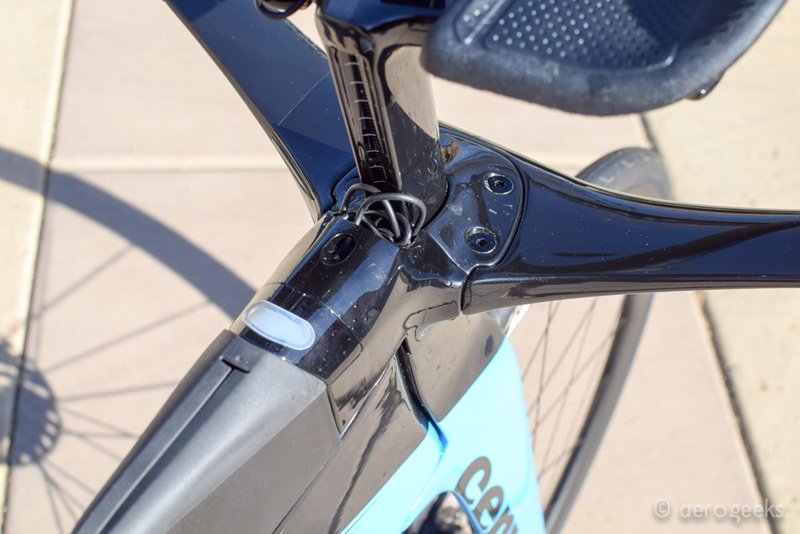 The answer came down to cooling and the current state of road disc brakes – simply stated Cervélo does not believe fairing the brakes would benefit the bike enough versus the concerns of the brakes overheating. The P3X supports both RAT and threaded thru axles. An aero thru axle is also provided. The P3X has 36mm of tire clearance (up from 33mm on the P5X). In practice this means the P3X can handle up to a 28mm tire with a required 4mm of clearance on either side of it. For comparison the Cervélo R and S has 37.8mm of clearance. 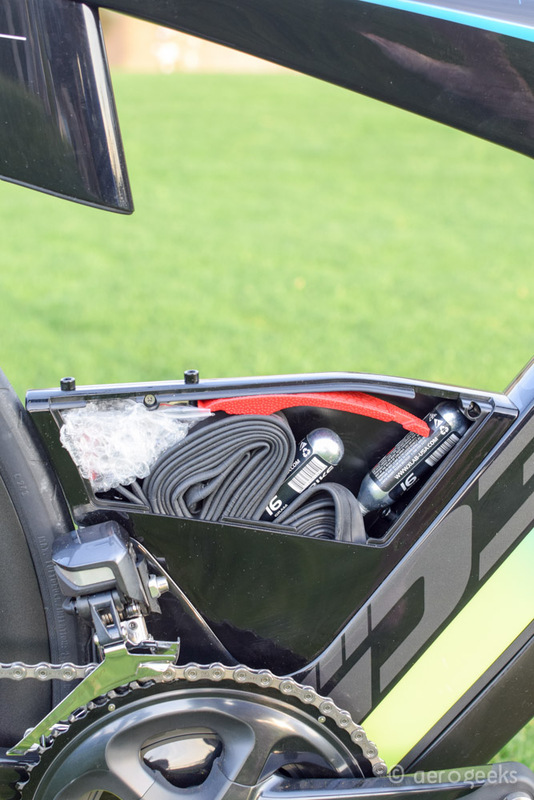 Being this is a PX bike – one built for triathletes – storage options are a must. The biggest visual difference between the P5X and P3X is the new Stealthbox 300 located just forward of the bottom bracket. On the P5X this was a large cavity (the original Stealthbox) in the bike itself for your flat needs (specifically one capable of holding a tubular tire which was no longer required). This cavity had an impact on the total weight and stiffness of the bike. On the P3X Cervélo has instead shrunk the carbon footprint and added a removable flat kit storage box. As you can see its actually two pieces – the part that connects to the underside of the frame and the box itself. From our test ride and playing with it, it feels extremely well connected to the bike and not liable to fall off. We were super impressed how the opening to the storage is actually located on the underside of the box itself so there is no chance your gear is going to slip out. Above the bottom bracket is the same storage box (Speedcase) as found on the P5X. This allows you to house both extra tools, a second flat kit, and emergency nutrition. You also get a pair of bottle bosses to mount an extra cage. At the back is the same seatpost as the new P5 which features a single rear bottle mount interface. In talking with Graham as to why they only included a single bottle interface versus a dual cage setup. They shared that aero testing showed the single bottle was a far superior aero setup. When designing the interface Cervélo crafted hollowed out alloy parts to eke out a few grams of weight savings. Like the P5X, the P3X is designed to accommodate 3 regular round bottles placed in the most aerodynamic position regardless of your choice. Bottle mounts are located behind the seatpost, on top of the Speedcase, and between the arms. The thinking is that grabbing and going from aid stations is the best way to go and this requires the ability to support round bottles. The P3X will be available in four sizes – S, M, L, and XL. The geometry with stack and reach is below. So, what did all of these changes and updates to the P5X concept accomplish? Well lets start with weight. 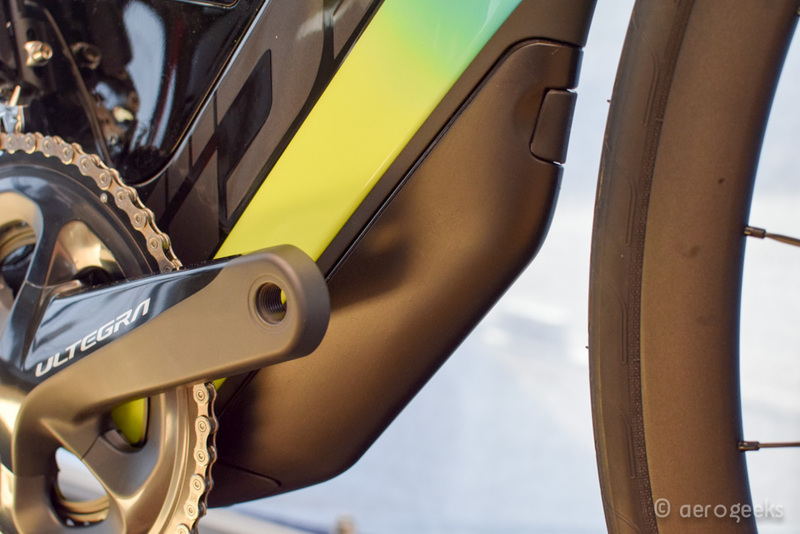 The P3X frame is 16% lighter, or 254g lighter in size medium than the P5X frame. This is due both to changes to the frame shape (such as removing the extra carbon used for the P5X Steathbox and replacing it with the Stealthbox 300) as well as a much more advanced cabon process that requires less additional carbon to ensure frame stiffness. 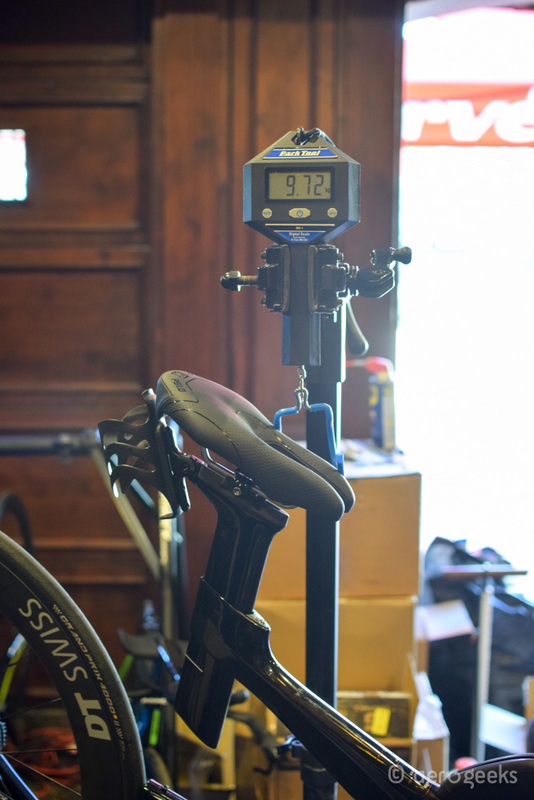 We weighed a complete Ultegra Di2 build (the second one you will read about down below) including cages, storage boxes, and maybe a flat kit in at 9.72kg. But the frame is only half the weight battle. Cervélo cut weight from many of the components as well. 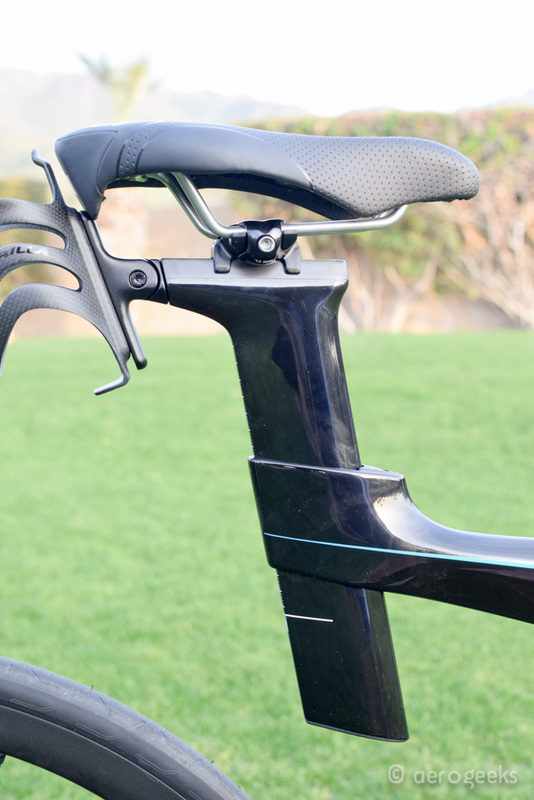 The basebar is 13% lighter, Speed Riser is 8% lighter, Speedpak is 43% lighter, and the Seatpost and Rear Hydration mount are 22% lighter. 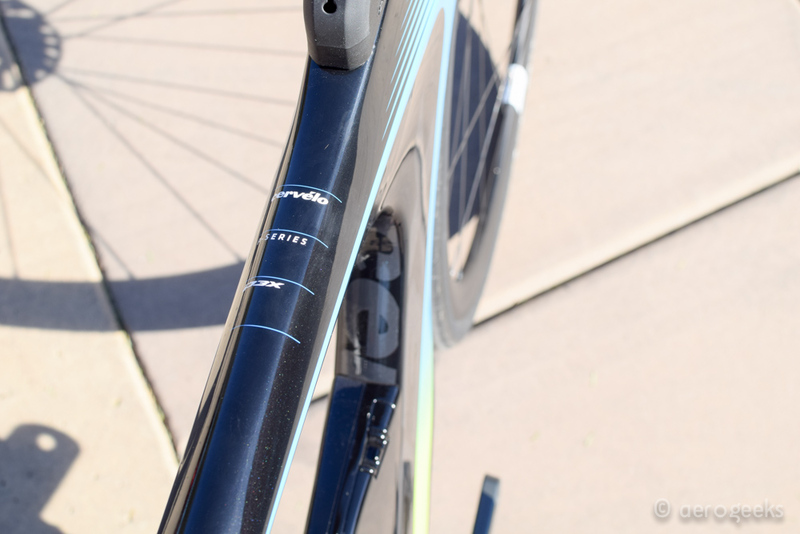 For Cervélo, making a lighter bike that was softer was not an option. 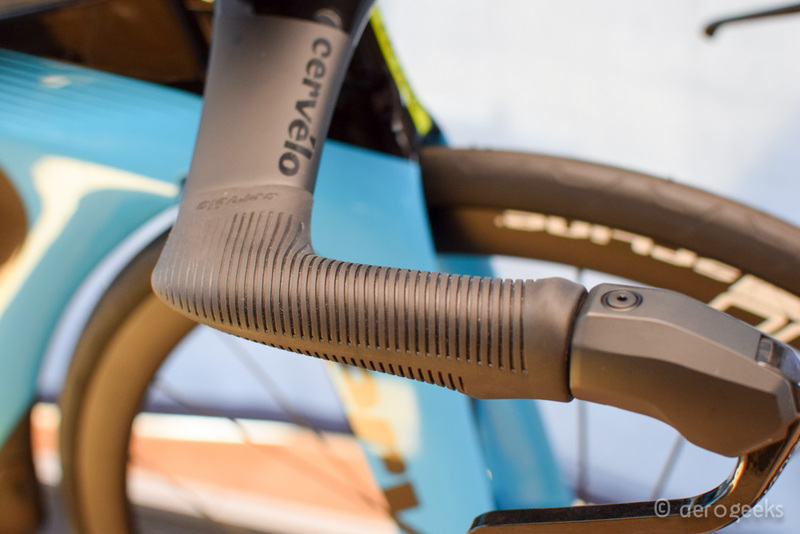 Cervélo optimized the stiffness of the head tube, for stable and predictable handling, and the stiffness of the bottom bracket, so that more of the athlete’s power is directly transferred to their forward momentum. The results is the P3X is 8% stiffer at head tube than P5X and 15% stiffer at bottom bracket than P5X. But is it faster than the P3X? Well no – no its not. Cervélo shared aero data related to two different nutrition configurations. The first is the Tri Light configuration which you might run in a sprint or Olympic distance race (unfortunately we neglected to write down if this was 1 or 2 bottles but will update this as soon as we do). And the second is the Tri Heavy configuration where you are long course racing and are maxing on hydration and nutrition. As you can see in either configuration the P3X is slower than the P5 across the majority of the yaw sweep. The P3X will be offered in two builds at launch. The first is the graphite\black\red P3X Disc Ultegra Di2 R8060. This gets you the P3X frame, Smartpak 600, Speedcase 600, Stealthbox 300 , and adjustable single rear hydration mount. Your drivetrain is a complete Ultegra Di2 R8060 system and your wheels are DT Swiss ARC 1450 DiCut 48/62 Disc. This will retail for $10,000 USD/$11,500 CDN/€ 9.999. The second build is the P3X Disc Ultegra Di2 2.0 R8060. This comes in a riviera/fluoro/black graphics package or as we call it – the AeroGeeks custom color package. You still get the P3X frame, Smartpak 600, Speedcase 600, Stealthbox 300, and adjustable single rear hydration mount. Your drivetrain is still Ultegra Di2, but you do get a 105 cassette instead of an Ultegra. And you will be riding atop a set of DT Swiss P1800 Spline 32 Disc. Retail price will be $8,000 USD/$9,500 CDN/€ 7.999. Like the new P5, your local Cervélo dealers will have a limited supply of bikes starting today (both in the US and Europe) lasting throughout March and April with wider availability as spring turns to summer. If the prices caught you a little by surprise – don’t worry they did for us as well. When we think P3 we think of the $4,200 mechanical version (conveniently forgetting the $6,000 Ultegra Di2 option). Both $8,000 and $10,000 seemed quite a jump to us. But the P isn’t the PX. And looking at the jump from the $7,500 new P5 to the $12,000 P5X; the jump from the $6,000 Ultegra Di2 P3 to the $8,000 P3X Ultegra Di2 does not seem as steep. With the P3X you also get disk brake wheels and hydraulic brakes as well as the Smartpak 600, Speedcase 600, Stealthbox 300, and adjustable single rear hydration mount. Not to mention the brand new, even more aero optimized frame. We wouldn’t call this a steal – instead we would say the price jump seems warranted as compared to the P3, new P5, and P5X. But we are also holding out hope for a much lower priced P2X! Something in the sub $5K range. (We hope this is the reason why the P3X frame supports mechanical but only is being built with electronic. Though we do think electronic was made for tri bikes so in the end we really hope for an electronic P2X that is lower priced). 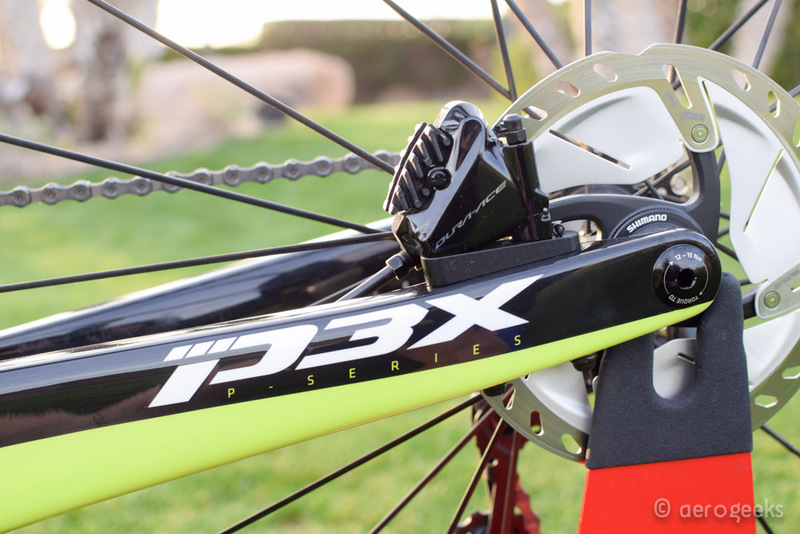 We spent just over 50 miles on the deserts of Scottsdale getting to know the P3X. 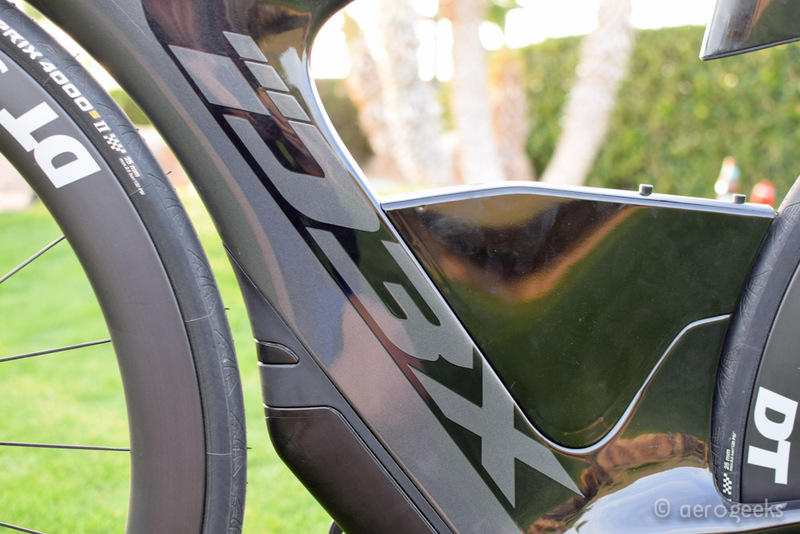 And the first thing we noticed when we were pedals up with the P3X was how normal it was. As we kept saying over and over – it may look different, but it rides completely normal. And we aren’t even saying “tri bike” normal. We spent most of the off season riding on aero road bikes, and the P3X felt more closely related to an S5 than P5X. It accelerates quickly off the line and is a steady corner. 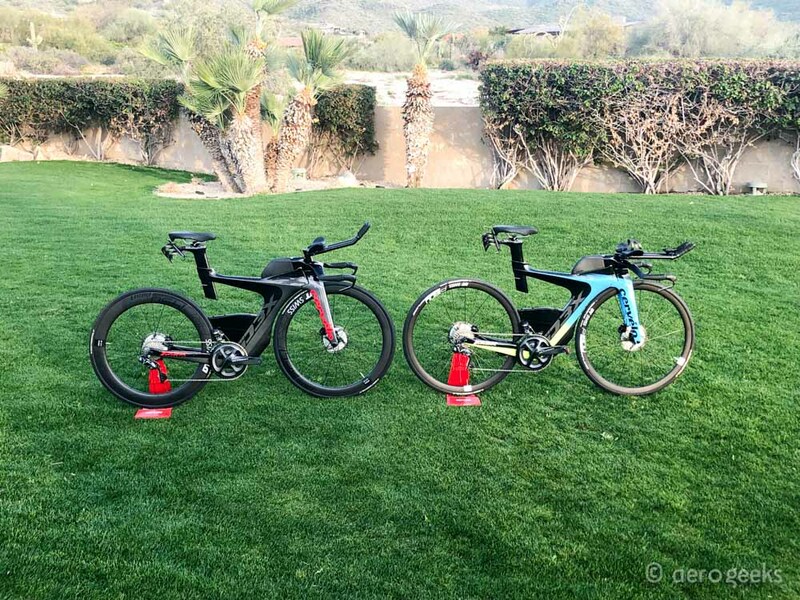 We unfortunately did our test rides on a bike a size smaller than we are accustomed too so we have some concerns that the nimbleness we experienced as compared to other tri bikes may be due to the size difference. But even so – it’s an extremely nimble bike. Being a beam bike, you may expect us to have felt disconnected from the road. Or worse to be over cushioned. What we found was quite the opposite. We felt a road bike like connection to the road. We would say it borderlines somewhat too much so as we may have preferred a bit more of the vibrations to be dampened out. 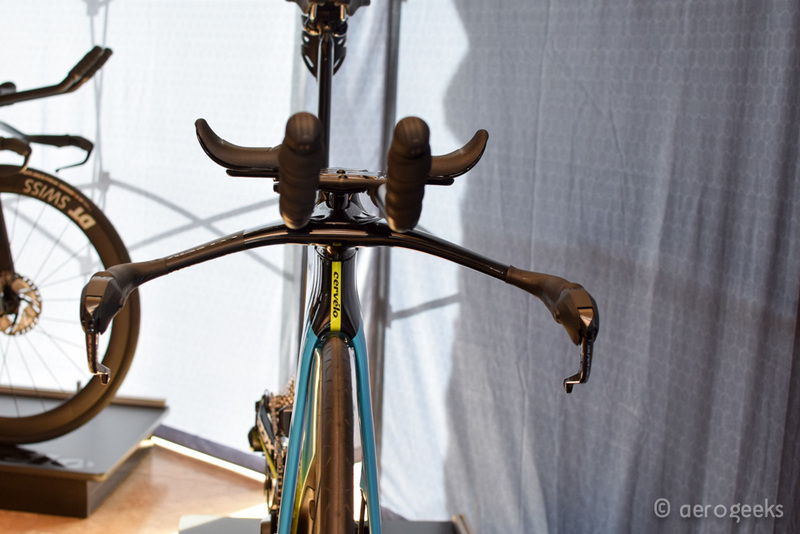 Luckily this seemed to be more noticeable on the base bar than on the aerobars when tucked into the new armpads. We did ride gloveless to spend time with the molded grips. We know most short course athletes (and many long course ones as well) forego gloves. We found the grips to be extremely comfortable for durations under 20 minute and had no issues with hand slippage. Once we got over 20 minutes, we found we needed to go back to the aero bars. The good news is there are rarely times you should be in the basebar for 20+ minutes (so for the most part this should be a non factor). Other issues? We do miss the folding basebar of the P5X. This was such a great design, but we recognize that when you go down market you are going to lose a few of the features. And that is about it. Really there are not a whole lot of changes we can suggest for the P3X. 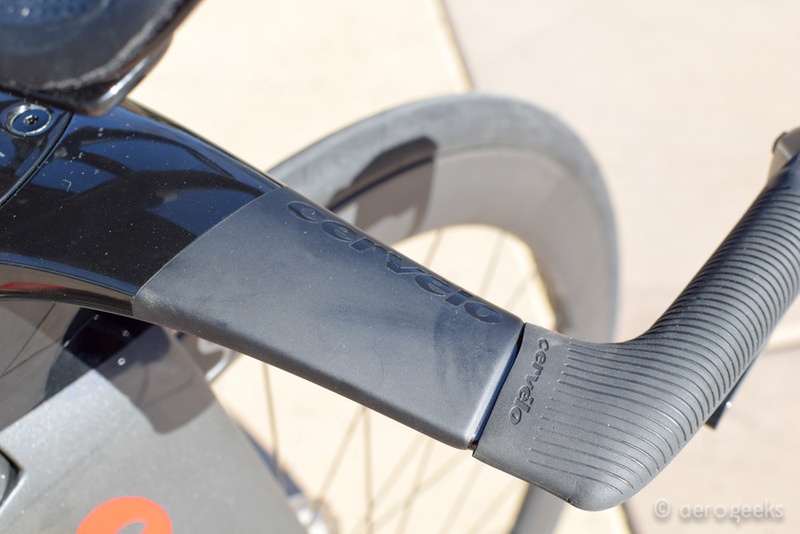 Our first impressions are that Cervélo built exactly what they were aiming for. So what’s next. 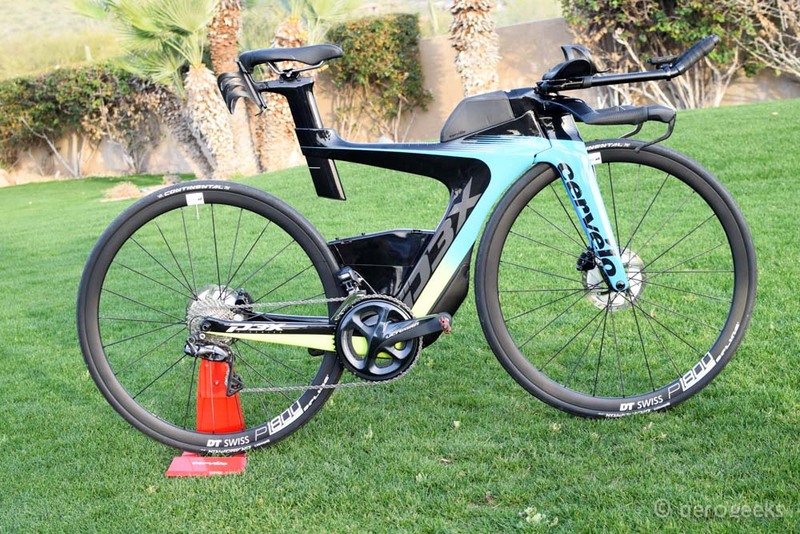 Like with the new P5, a long term review of course. And while we typically always look to get the fastest option available. 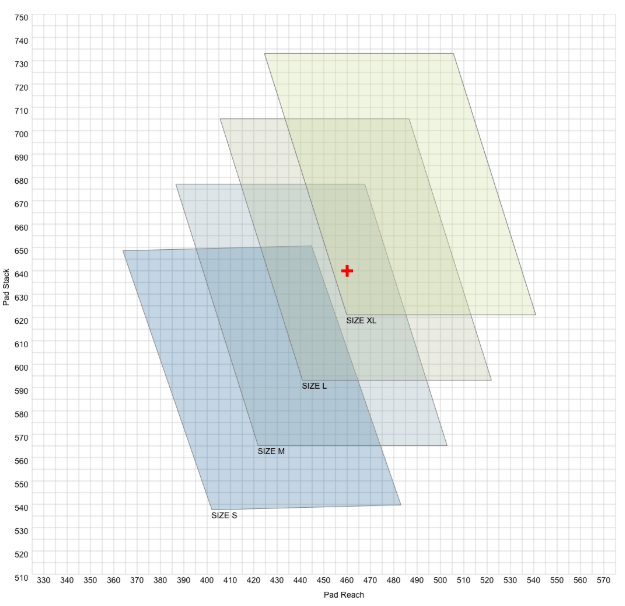 We won’t be passing up the opportunity to spend some time on that AeroGeeks colored option. As always thanks for reading and make sure to stay tuned to AeroGeeks.com for our long term reviews of both the P3X and new P5. So now we need a P5X SL? 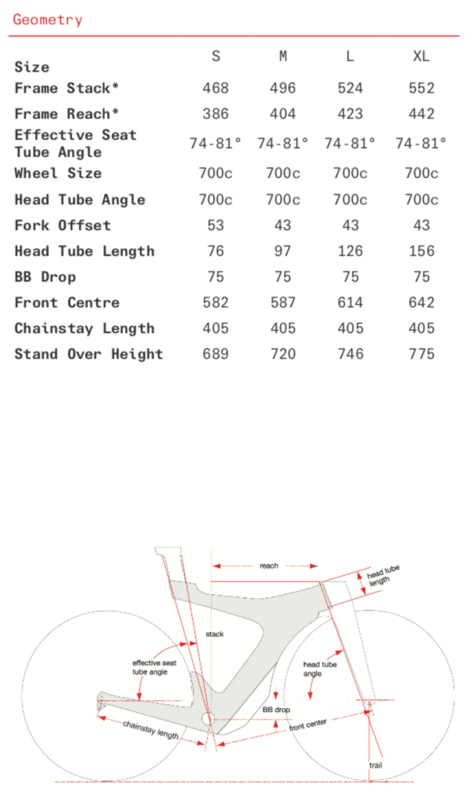 ( super light ) Something with Dura Ace or SRAM? If you had to choose one do you go with the new P5 or the P3X? I know it is tough to compare, but which is faster. 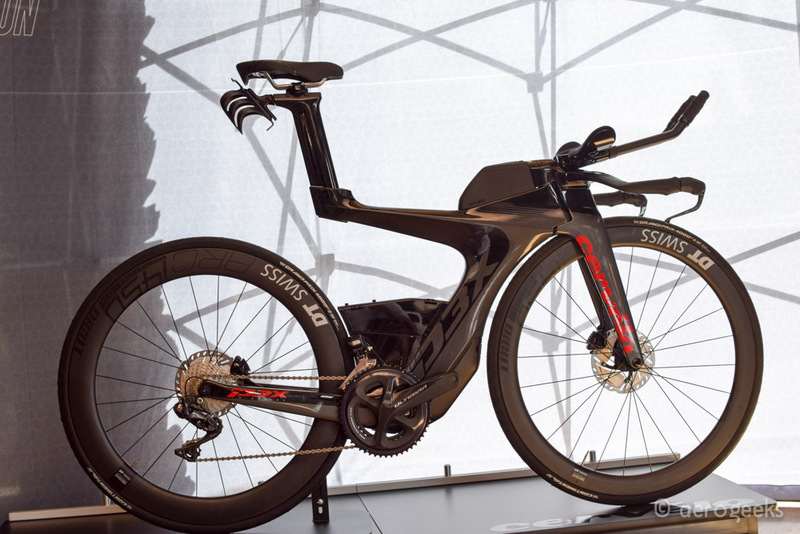 Seems like the P5 would be the faster bike since it is lighter and more aerodynamic. I’m in the market for a new bike and was all set on the P5 and then they released the P3X. One too many options. Great articles on the P5 and P3X! I don’t think there is an absolute answer. It more comes down to a number of questions. First can you fit on both? The P5 is not as forgiving as the P3X. Second are you looking for short or long course racing. And are you more of a pack rat? Those three details would have a huge impact on what we would answer. 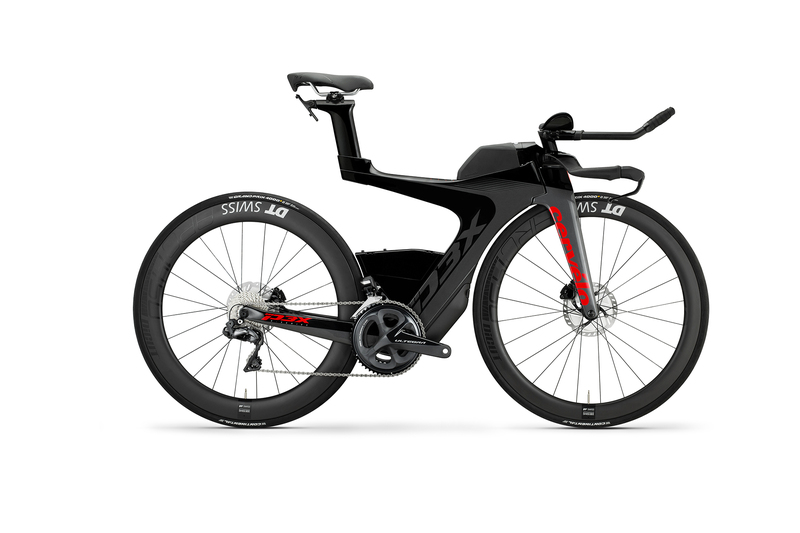 I do ironman distance – have a p5 am looking at p3x – p5x is not available….like disc brake, electronic shifting etc. afraid it might be too slow and never rode a floating seat? thoughts – i need every min. to hopefully qualify for kona.